News & Trends Luxury Yachts in St. Barts: The Latest Trend to Set Sail! Luxury Yachts in St. Barts: The Latest Trend to Set Sail! Emerging as one of the most exclusive domains for luxury cruising St. Barts is indeed a sailor’s paradise. In fact, if you must know then this place is currently on top of the list for yacht charter destinations. Every year, it attracts a huge number of luxury yachts to its translucent beaches. It protrudes a dominant French influence that adds a cosmopolitan edge to the soft sands, turquoise blue waters and isolated coves. Luxury yachts in St. Barts are quite a delight for the majority of tourists for these reasons. Choose hand-picked luxury yachts in St. Barts if space, convenience and speed are your calls. Get these factors in crewed motor yachts. These vessels are generally 50-80 ft. in length with as more as 4 cabins. Furthermore, there will be a professional crew aboard with highly skilled and trained members to take care of all your specific needs. So, stumble on an amazingly choreographed journey sailing the Caribbean and get dappled on the winter sun. Explore the hidden bays and coves that often remain untouched by the tourists who prefer staying under the confinements of a five-star hotel. What else sounds better than catamarans when it comes to luxury and comfort? Boarded catamarans with exclusively designed suite render an unmatched 360-degree view of each scenic backdrop. Moreover, these double-hulled vessels are perfect if you are travelling in a large group. The entire group can accommodate comfortably on a 40 ft. long catamaran. Opt for a smaller one of 30 ft. if the number of heads is less. Avail crewed catamarans if you want to have a unique cruising experience with optimum opulence and ease. You will be getting an experienced skipper, chefs and other staffs to make your vacay an extraordinary experience. Planning to be the captain of Caribbean this time? Then, charter bareboat vessels. Sail at your own pace, exploring the mystic coastline & their wonders. You see these remain highly in demand during the peak months ranging from December to April. So, it would be best if you book beforehand to cut the risk of ‘sold-out’ of your desired vessel. Untie the magic of simplicity along with ecstasy with a skippered sailboat when you move from Flamands Beach towards the Saline beach. Have a leisurely and laid-back vacation with the skippered sailboats. However, if you want to have a self-administration and have your own GPS set, go for yachting in St. Barts on our bareboat sailboats. Connect to the flow of the sea on a primal level as you opt for a sailboat. It gives you a unique feeling on the sea as there will be no reliance on gasoline but only on manpower. Luxury yachts in St. Barts are queuing up right now as it is winter! If you are ready for your winter break, then wait no further for holidays are not to be delayed but enjoyed. 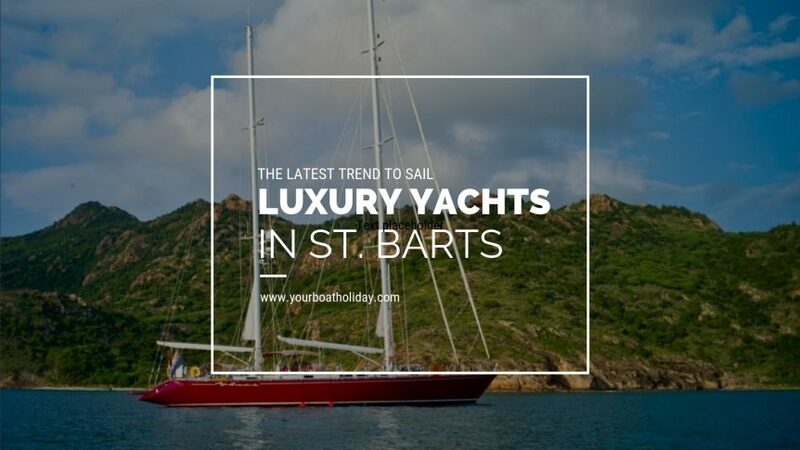 Luxury Yachts in St. Bart: The Latest Trend to Set Sail!Luxury Yachts in St. BarthLuxury Yachts in St. BartsLuxury Yachts in St. Barts: The Latest Trend to Set Sail!